Force field analysis is the creation of the American social psychologist Kurt Lewin, widely regarded as one of the early 20th century founders of social and organisational psychology. 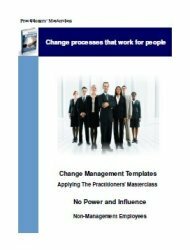 Lewin developed the change model - known as "Lewin's Freeze Phases" - which still forms the underlying basis of many change management theories models and strategies for managing change. 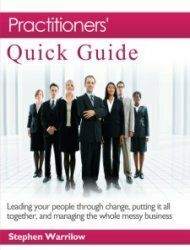 Given that the people aspects of change is the overwhelming issue and in the light of the high failure rate of so many change initiatives, it is clear that managing the change transition requires time and sensitive skilful leadership - exercised within people-focused change management processes. This can only be consistently achieved by addressing all of the key factors that will make it possible. 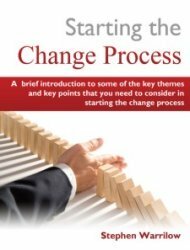 Lewin’s force field analysis work provides a practical tool for assessing the case for change - a necessary precursor to the creation and implementation of a programme based approach to managing change. 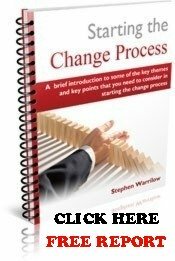 It does this by identifying the key forces and drivers for making the change and also those key forces that will be in resistance to the change. Underpinning his famous freeze phase model are 2 these important and in my view foundational concepts. Firstly the "Lewin’s equation", introduced in "Principles of Topological Psychology" , which is not actually a strict mathematical equation showing quantifiable relationships, but rather a heuristic - an experience based or rule of thumb technique - for predicting human behaviour. The formula states that B= f(P,E) where B = Behaviour, F = Function, P = Person and E = Environment. Lewin stated that behaviour is a function of the person and his/her environment. Thus the situational perspective of a person's present situation is the bigger key to understanding his/her behaviour instead of relying solely on past experiences and influences. Lewin’s second foundational concept was the previously mentioned “Force field analysis” which provides a framework for looking at the factors or forces that influence a potential change situation. According to Lewin: "An issue is held in balance by the interaction of two opposing sets of forces - those seeking to promote change (driving forces) and those attempting to maintain the status quo (restraining forces)". In Lewin’s view, organisations can be seen as systems in which the current situation is not a static pattern, but rather an "equilibrium" - or “dynamic balance” of forces working in opposite directions. Thus, any change that may occur is dependent on a shift in this balance or equilibrium where the driving forces need to exceed the restraining forces. 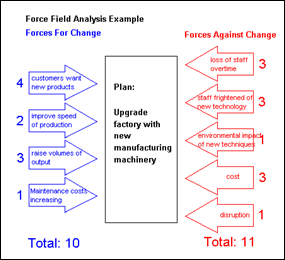 In a potential change situation a force field analysis can be an extremely useful tool for assessing the possibility and viability of a change initiative. What will happen if we don’t get there? What are forces or drivers for this change? What are the forces or drivers against this change? 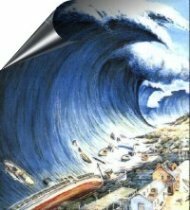 What are the strongest forces for and against change? What will be the impact of changing and not changing? The next step is to take a white board and as shown in the video above, draw a schematic and list the forces for and against the change. Most importantly apply a weighting to each of the forces according to their scale of influence and using a scale of say one to five, where one equals little driving force and five equals major driving force. When you have finished listing and scoring the forces for and against you can see which side has the highest score. Now that you have completed your Force Field Analysis, you can either use it to decide whether or not to press ahead and make initiate the change initiative. 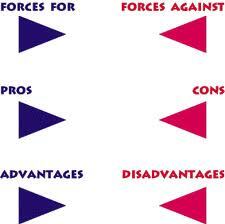 Alternatively, you can decide to strengthen the supportive forces and/or weaken the resisting forces. 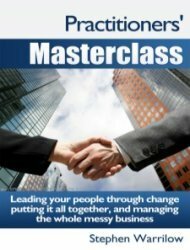 The output of this analysis will establish the foundations for the business case for change and the input to programme based approach to managing the change. Return from "Force Field Analysis" to "Change Management Theories"